There’s no escaping bugs when you have two little boys in preschool. They bring home an amazing assortment of bacteria and viruses, some of which leave them feeling awful for days or even weeks on end. I usually manage to avoid catching their miseries, but this week it’s my turn. We’ve been working overtime prepping the house to sell, as well as researching towns, schools, and homes in the DC area. Plus the baby still wakes up to be fed once or twice each night, and sometimes he just wants to party instead of going back to sleep. So when I woke up Thursday a week ago with a sore throat and a headache, I wasn’t the least bit surprised. It did make our house hunting trip last weekend a bit tougher, though. This is not my typical cooking post, but it’s cold and flu season and I got to thinking about it over the last few days, wondering about other possible remedies for the common cold. Stores stock their shelves with a huge assortment of cold medicines, many designed to cover a range of symptoms, but I’ve found that I have trouble using anything that has “decongestant” or “antihistamine” on the label. No matter how much I push fluids, I still seem to shrivel up like a raisin when taking those types of medication, and forget about trying to stay awake. If a medicine label says that it may make you sleepy, you can bet the farm that I’ll be out for several hours. So unless I am desperate, I try to use home remedies as much as possible. If I still had a bottle of Japanisches Heilpflanzenöl, I would have started using that right away. A tour guide told us about it during our honeymoon in Germany, so we went to the pharmacy and bought a bottle to give it a try, and it literally saved our trip. Michael dubbed it “magic dust,” although it’s not a powder—it’s a very strong minty oil that you add to hot water and drink. It only takes a few drops, and it opens the head up right away, but unfortunately our bottle of magic dust is long gone and I don’t have any on hand. So this week I’m doing all my favorite home remedies to ease the discomfort. When I feel a cold coming on, I start eating chicken noodle soup to try and ward it off. If my throat starts hurting, I drink hot lemon toddies (without alcohol). I usually hold the mixture up to my face and breathe it in for a few minutes, and the steam helps to clear my head. 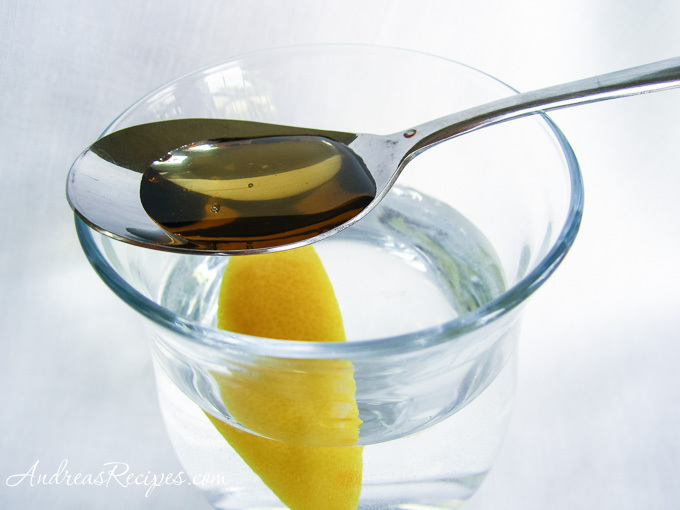 The lemon juice helps break up the stuff in my throat and the honey and hot liquid soothes nicely. Steamy showers are also great for opening up a stuffy nose. This leads me to ask, what do you do to take care of yourself when you have a cold? What is your favorite home remedy? Is it something that your mother made for you when you were a child? Do you eat or avoid certain foods? Have you tried jala neti? Feel free to share in the comments, and maybe we’ll all pick up a few new tricks to help survive the cold and flu season. Put lemon wedge and the water in a microwave safe mug. Cook in microwave on high for 60 seconds or longer depending on your microwave. Just get it hot enough to drink, don't burn yourself. Using the back of a spoon, press the lemon wedge against the sides of the mug to release all the juices. Stir in the honey. Alcohol is a common component in hot toddies, such as whiskey, brandy, or rum. If my grandfather were still alive, he might suggest adding a bit of his "home brew." It would clear up anything, but it could also clean your carburetor. 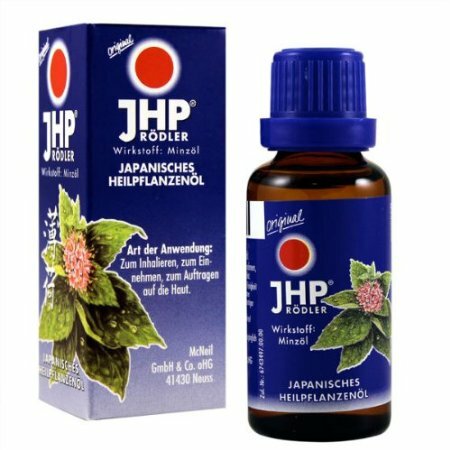 I just did a search and the Japanisches Heilpflanzenöl is available at amazon.com for $30.95. Sounds like something every home medicine cabinet needs to stock. I get awful, awful colds and sinus infections, so any new kind of treatment would be welcome. I’m ordering a bottle. Right, I just saw it, too. They also have a smaller 10ml bottle for $12.50. The shipper is http://www.smallflower.com, but I don’t know anything about them. Let us know if you have good luck with it. I’m looking for the old time recipe that our grandparents used to make when we were sick with the spices, brandy;scotch and etc…..Do you have this recipe? Hi Neda. I’m sorry but I don’t have recipes for anything like that.